We need spring to arrive. It seems that spring fever is hitting the farm hard this last week! I will share with you some of the ups and downs of the last 7 days. The chickens are plucking themselves out of boredom, I have now taken to giving them entire heads of lettuce and cauliflower to chase around the coop. It seems to help, for a short while. I sadly had to re-home one Golden Laced Wyandotte as the rest of the flock seemed to think she was a head of lettuce, and would chase her around pecking her poor bleeding backside. She has now joined a new flock where she can recover peacefully. The new chicks were doing marvellously well, peeping away in the laundry room. But alas, two days ago they began to sneeze. What followed was a full scale epidemic, and armed with Superbooster I have been dosing them in an effort to combat the cold. Three have recovered quite nicely, but the fourth is still in critical care. I feel terribly responsible for the life of this tiny chick, and so I diligently ensured she got her share of antibiotics via an eyedropper. It remains to be seen if she will pull through. I certainly did not need any more chaos added to the mix, but our Livestock Guardian dog (LGD) decided to scuffle with our wee mutt. An initial vet visit was made, and all seemed fine. Some antibiotics and a clean up of superficial wounds. But over the weekend the wee dog didn't fare to well. What followed was a trip to the emergency vets (why is it that these things always happen after hours?) where he was treated for infected lymph nodes. He now has a shunt to drain the large abscess in his neck and is sporting a cone to keep him from scratching at it. Our other dogs feel that this cone is simply a unique handle by which to grab him as he runs by. We have resorted to crating him, where he sits miserably wondering why he is being given a time out. 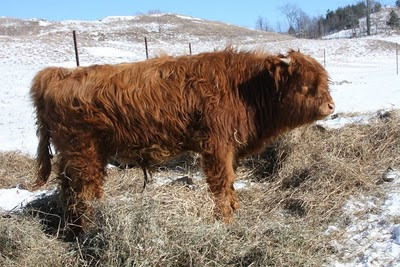 Our female LGD has just this week been hit hard with spring fever, and has found all sorts of unique ways to scramble under the electric fencing. She discovered that if she ran quite quickly, and flattened herself at the last minute, she could slide on the ice under the bottom wire with a whoosh! and land on the other side untouched. What followed was hours of us wandering our 50 acre property trying to listen for the sound of her cow bell. Thankfully she wears a cowbell, or we would not have found her on the neighbours front lawn. With all of this excitement, it was kind of touching to watch our wee bullock frolicking in the sun. And he does frolic. As the air warmed today, you could see his excitement - he began kicking his heels up like a wee elf in delight, knowing that warmer weather is coming. I hesitated for a moment as I watched, and then thought "why not?" and I too did a little leprechaun jump. It can't hurt, can it?